We help people, organizations, and businesses share their Visions for the world with copywriting, video, photography, marketing, and more. What is your Vision for the world? Let us know what you are trying to accomplish and we will put together a preliminary plan to help you get there, including services that we can provide or recommend. Our diverse experiences, training, passions, and influences may be just what is needed to help you manifest your Vision projects and share them with the world. Here are some of the things Shared Visions Unlimited can do for you to help expand your life and business. We provide copywriting services for special interest blogs, white papers, websites, social media campaigns, newsletters, and direct response marketing. Greg has a long history of using video for promotion, training, special events, music, and most things video can be used for. We provide photography, for travel, marketing, special events, product profiles, and locations. In a business context, video and photography are best combined with copywriting within a marketing strategy to be effective. That is why we will talk about copywriting, multimedia, and marketing as a Trinity For Success. Writing for content, marketing, newsletters, travel, and more. Video and photography services for business, performances, and special events. Most projects require some form of marketing, which uses copywriting and multimedia elements. Founder Greg Dixon recently married Bonnie McDonald and traveled 25,000 km or 16,000 miles trying to stay between the snow line and the alligator line in the southern states in 2017-2018. 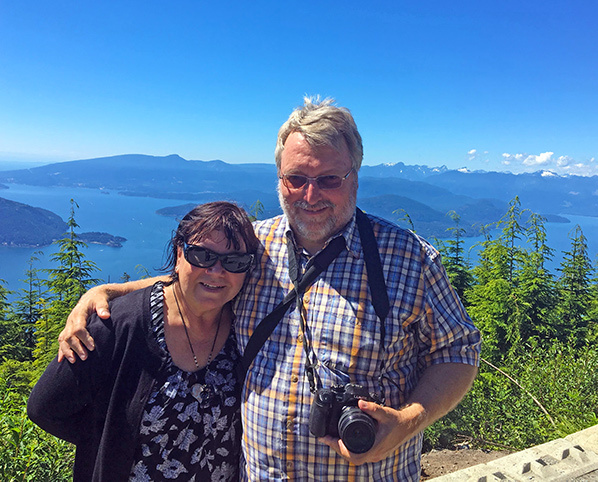 Here is a recent photo of us at Bowen Lookout on Cypress Mountain in West Vancouver. We are looking a little windswept from the climb! Greg’s background is video, photography, writing, music, software engineering, project management, many strange jobs, and a whole lot of travel. Bonnie has done almost any job you can think of, including being a postie in the Mojave Desert and cutting lawns on a golf course. She also worked/played for many years in many aspects of the natural foods industry up and down California, Oregon, Washington, and British Columbia. She wrote a food blog for years and wrote a book on How To Get A Job You Love. By the way, Bonnie grew up in Southern California and is a dual citizen. Looking for something on the old site? It is still available at www.svunlimited.com. You can translate this site into many different languages such as French, Spanish, German, Russian, Greek, Persian, Chinese, and more using the Google Translate widget found in the Sidebar.